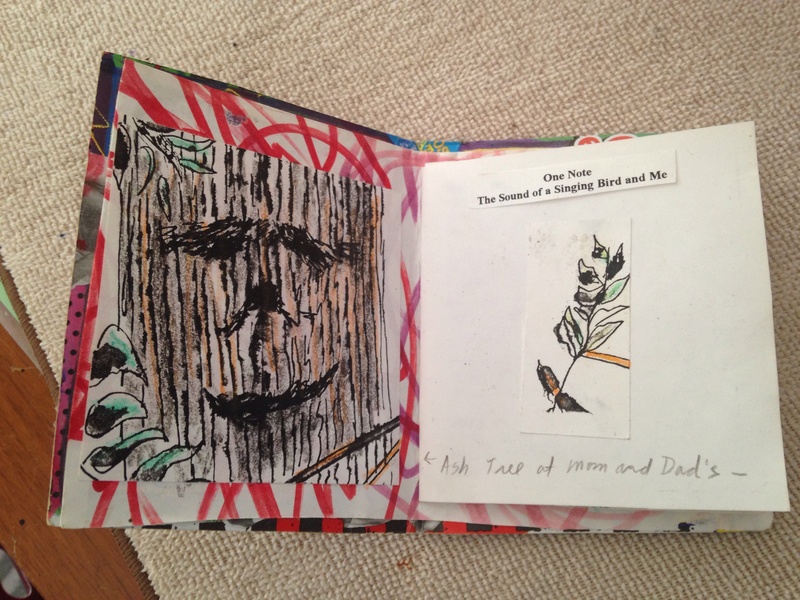 Oldest Son and book making. Before saturation of words on the internet and before the underground resonance grew on making books the old-fashioned way… there was a silent breathing in. Living in a tree house apartment in the heat of summer with the sound of a noisy air conditioner; created moments of summer that danced by too slowly. Since we were not in the best part of town my family did not visit. So I came up with fun projects to do with oldest son ( anywhere from 3 to 6 years old). We recycled most of the materials; cereal boxes and cardboard. 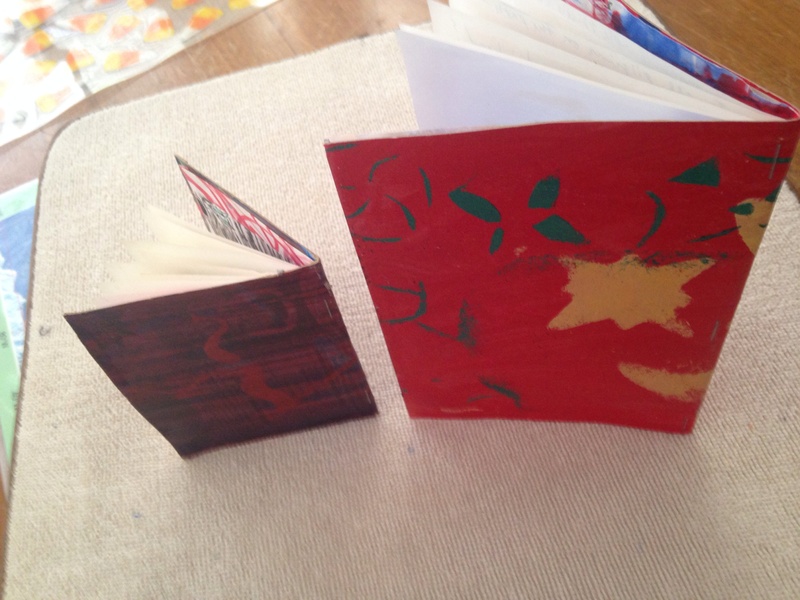 All aspects of these books are handmade…only the paper and typing stray from this theme. I at one time had several of these books all around the place. Finally in the last year I brought them all together. All are here, finished books mixing with some at different stages of completion. Years ago I gave one to my Dad on his birthday. The small purplish one in the image above. The little book sat on parents’ hearth for years until his death and I now have it back. 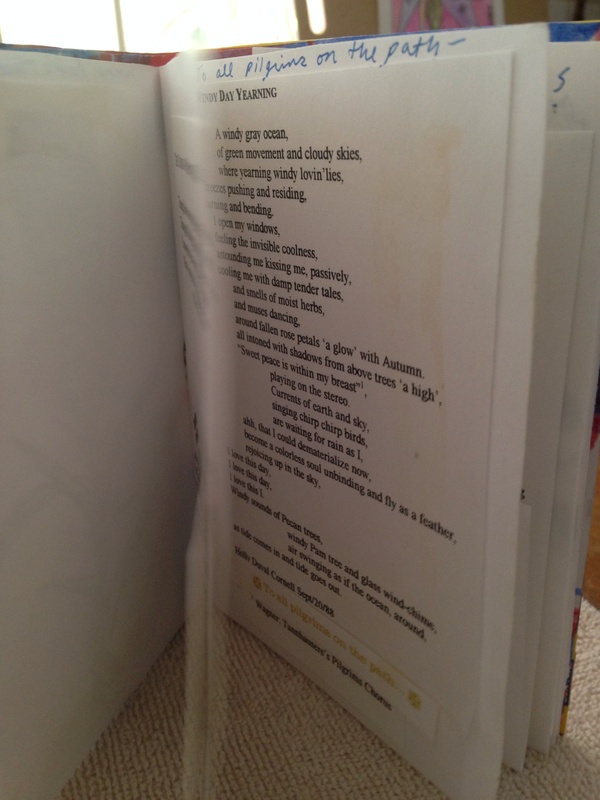 Filling the pages with my watercolor partings and typed poems, son and I had fun putting them together. 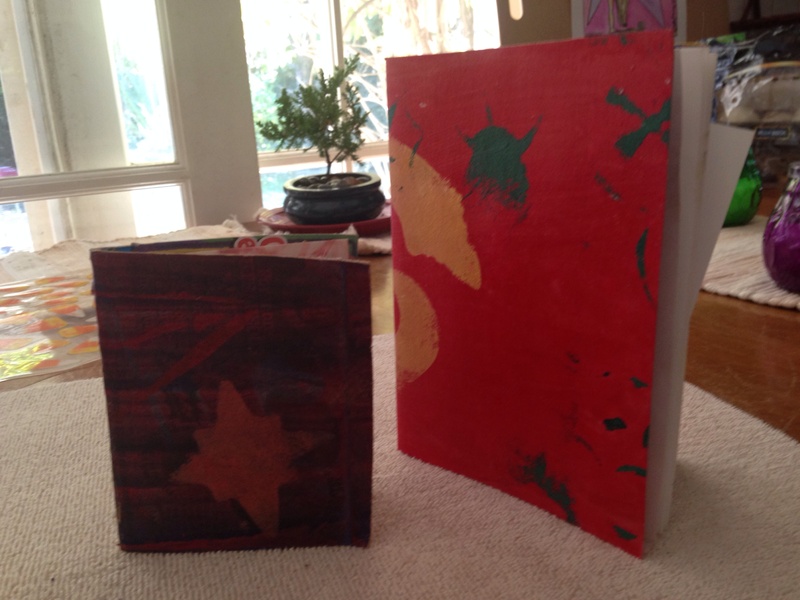 We painted the covers with acrylic paint and mod podge, and correlated the inside papers, and stapled this all together. The simple joys of life are ones that are creative, progressive and quaint. During the heat of summer the sound of air conditioning muffled the nearby gang screams… but we created something special together. Two of the books have now come to rest on our hearth, my heart is there also. This entry was posted in "In the beginning there was a void except for the written word." The Avengers (Band) and tagged Alternative music, Book making, Flipside Fanzine, Goddess and Home, Oral Tradition, postaday, Praying Mantis, spirituality, the written word, Underground, Women. Bookmark the permalink.